Jack, the winner ‘will’ be happy ! very very well done buddy !!!! It would be nice to see design, picture from the back may be? I used to be a runner/triathlete before my hips shot craps and have so many medals hanging on the wall just for finishing races but it’s the trophies when I actually placed that are the most sentimental to me – and this is better than any trophy I ever received! 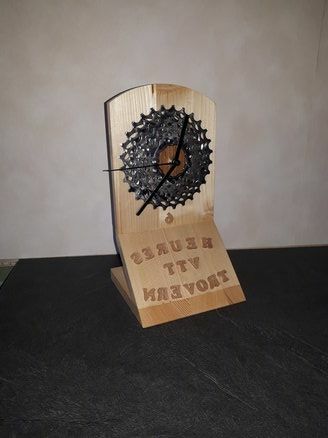 Nice use of the gears, it will definitely be a show piece for the winner. Might it be you? 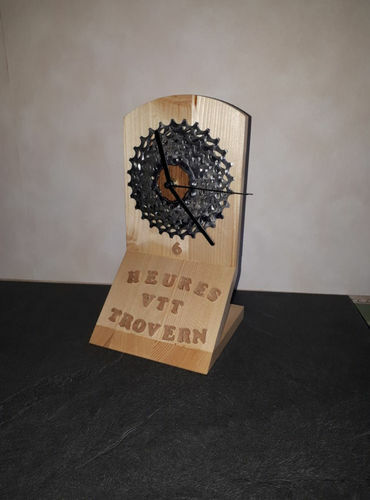 Nice looking clock, using the gears was very creative idea. Jack, niced job. I like the design. Great trophy. Enjoy your biking. You did a very nice job on this clock.